With the A. O. Shirley Recreation Grounds unavailable for their use, the BVI Football team began play in Dominica yesterday in their home leg of their first round of FIFA World Cup Qualification for Russia 2018. They will face Dominica again on Sunday. Those two games will be the third in a week, after the team—finding themselves short handed because of a FIFA eligibility rule—suffered a 1-0 loss to Antigua and Barbuda on Sunday, in their final tune up match. Nine of the 23 players on the team—although born in the BVI—were deemed ineligible because they were born to parents from outside the territory and do not have BVI passports. With the development, coach Avondale Williams had to hastily rearrange his team ahead of the game. 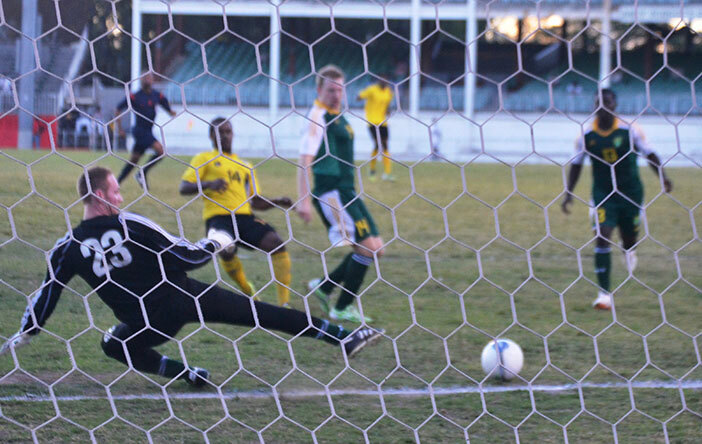 Six minutes into play, Antigua and Barbuda’s Mervyn Hazlewood took advantage of a defensive lapse to calmly slot home past the goalie Daniel Barker for what turned out to be the game’s lone score. Despite the challenges, Williams was pleased with the overall performance of a hastily rearranged team, which had fallen foul of FIFA’s eligibility rules.